Clinton: Participation not appropriate given "continued violent and unjust actions"
WASHINGTON (CNN) -- The Obama administration has decided to rescind invitations to Iranian diplomats for July Fourth celebrations overseas because of violent crackdowns against protesters in Iran, the White House said Wednesday. 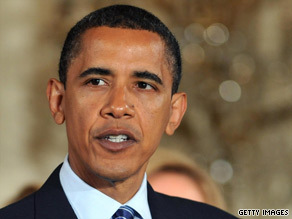 President Obama on Tuesday toughened his stance on Iran's crackdown on protesters. "July Fourth allows us to celebrate the freedom and the liberty we enjoy: freedom of speech, freedom of religion, freedom to assemble peacefully, freedom of the press," White House Spokesman Robert Gibbs told reporters. "Given the events of the past many days, those invitations will no longer be extended." The administration had decided to invite Iranians to the celebrations at overseas posts as part of the president's policy of engaging the Iranian regime. In late May the State Department sent a cable to its embassies and consulates worldwide informing them they "may invite representatives from the government of Iran" to their July Fourth celebrations. But in a fresh cable sent to all embassies and consulates Wednesday evening, Secretary of State Hillary Clinton ordered posts "to rescind all invitations that have been extended to Iranian diplomats for July Fourth events. "Unfortunately the circumstances have changed and participation by Iranian diplomats would not be appropriate in light of the Iranian government's continued violent and unjust actions against its own people," said the cable, obtained by CNN. "For invitations which have been extended, posts should make clear that Iranian participation is no longer appropriate in the current circumstances. For invitations which have not been extended, no further action is needed." A senior administration official said Clinton made the decision, and then informed President Obama. The U.S. receptions marking Independence Day usually feature symbols of Americana, such as hot dogs, red-white-and-blue decorations and remarks by U.S. officials about America's founding fathers. One senior administration official said Wednesday the reconsideration of the July Fourth invitations is consistent with Obama's comments Tuesday, in which he said he was "shocked and appalled" at the violence against demonstrators. "The president said yesterday how this plays out will affect what we do," the official said. On Tuesday, Rep. Ileana Ros-Lehtinen, R-Florida, the top Republican on the House Foreign Affairs Committee, said an invitation to Iranian diplomats would send the wrong message to Iranians "who are bravely standing up for the same rights and freedoms which Americans celebrate on this day." "The Fourth of July is a day when we celebrate democracy and reflect on the gift of freedom which all Americans cherish," she said in a statement. "The Iranian people are no less worthy of freedom and self-governance than citizens of the United States." Earlier this year, as part of the policy to engage Iran, Obama videotaped a message for the Iranian people on the Persian new year and U.S. officials have engaged members of the Iranian government. In March, Richard Holbrooke, the Obama administration's special representative for Afghanistan and Pakistan, spoke briefly with Iran's deputy foreign minister, Mohammad Mehdi Akhondzadeh, at an Afghanistan conference in The Hague. Administration officials believe the U.S. will engage Iran at some point to address issues of U.S. national security, including the nuclear issue, but the idea of bilateral engagement is in a holding pattern while the violence continues. "I wouldn't say engagement is off the table, but it is certainly on ice," a senior administration official said this week.